Learn why it’s difficult to make black-and-white decisions for the end of life when death itself is a mystery that will unfold with its own timing. This week is a solo episode in which I share two stories about hospice patients I cared for and the unpredictability of death, even when a terminal diagnosis is present. This reality means that we have to keep growing in our awareness and acceptance of death as a mystery, even while we complete paperwork that gives concrete instructions for our last days of life. AND I feature some clips from my beautiful daughter Gia’s new album of Healing Chants! You can still sign up for A Year of Reading Dangerously and expand your consciousness about death by reading books throughout 2018! Sign up here. Get the Teaching Guidelines for a Death & Dying Class then join our work group in March as we team up to help one another create our own unique classes! A HUGE THANK YOU to my supporters on Patreon.com/eolu: Julie Lester, Brian Hempstead, and Mandy Pierpoint! Your generosity means so much to me! And thanks as well to all of the donors who have made pledges over the past year. I appreciate you so much! If you’d like to become a patron and receive the Hospice Happy Hour Q&A recording each month along with other bonuses go to Patreon.com/eolu to learn more! I learned through my hospice work that death is a mystery and cannot be predicted or controlled unless we choose to take it into our own hands. Even then the method we use to end our life might fail or we might die of other causes before we can carry out our plans. But that mysterious aspect of death makes it endlessly fascinating to witness. If we can adopt a beginner’s mind about death then we can gradually become more relaxed and less fearful as we watch it approach. As we work to complete our advance directives and put our wishes into writing we should also remember that this paperwork is not a guarantee of how our final days will unfold. The legal forms just help us prevent an outcome we don’t want. But when and how death comes will still be a mystery and we may end up awake and alert during our final days and responsible for our own decisions. So we would do well to keep learning about death and growing in our acceptance. In that way we can best prepare ourselves for any decisions we have to make at the end of life. Remember there’s a new episode each Monday! Please tune in again next week and, if you enjoy this content leave a review on iTunes. Check out Gia’s new album – you’ll hear her beautiful song Evocation as this episode ends!! Learn how our 100-year history of ignoring death has led to a death-phobic society and the consequences we face as individuals. In this episode I share my thoughts on the negative effects, for individuals and for society in general, of our dysfunctional relationship with death. This topic leads into my theme for 2018: Death Education for Everyone, which you’ll be learning more about in upcoming episodes! There’s still plenty of time to join the year-long reading group for 2018: A Year of Reading Dangerously. We just finished reading When Breath Becomes Air for January and are moving on to Smoke Gets in Your Eyes by Caitlin Doughty for our February selection. Click here to join the reading group! Huge thanks to all of my current supporters on Patreon.com/eolu! I appreciate your generosity very much and also the emotional and spiritual support I derive from knowing that you are listening and that you care about the work I’m doing! For the past century we here in the U.S. (and other developed nations, as well) have been gradually slipping into a state of ignorance about death. With the rise of modern medicine and the funeral industry, death has been removed from the home and from day-to-day life, allowing us to shove death into the far reaches of consciousness and to deny to ourselves that it exists. So commit to start recognizing the presence of Death in your life every day until you can embrace and appreciate Death as a necessary component of Life. Then go out and start teaching other people to do the same thing! Tune in each Monday for a new episode. If you enjoy this content please consider leaving a review on iTunes! Dr. Karen Wyatt discusses the lessons she learned about life from working with hospice patients. 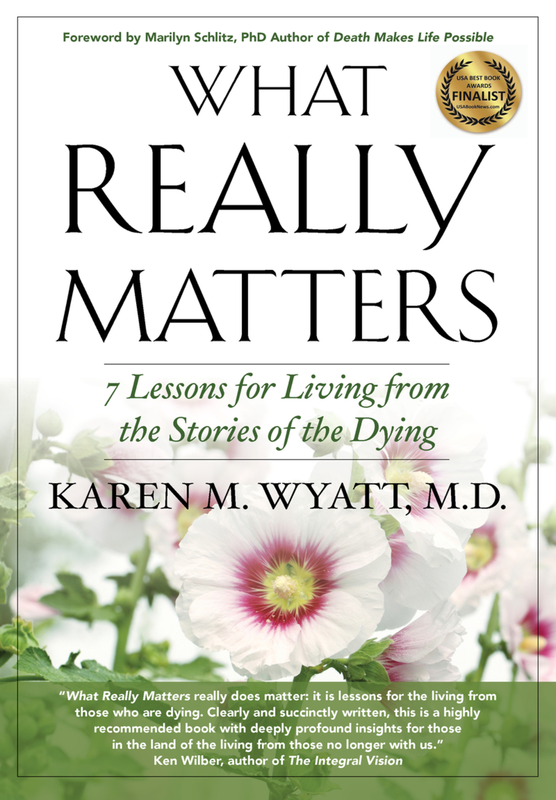 These lessons were the foundation of her award-winning book What Really Matters: 7 Lessons for Living from the Stories of the Dying.